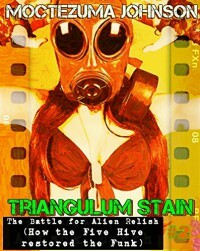 Last summer I indulged myself in aWTF Friday read of Triangulum Stain by Moctezuma Johnson. It was pure b-grade schlock, a literary science fiction cheese-fest (with a sexually subversive spin) that played with all the alien invasion tropes. I enjoyed it, but lamented that the story really just stopped, with only a suggestion of an end, and left me with a lot of questions. Fortunately, Johnson has since reopened the case (and provided some answers), introducing The Battle for Alien Relish as the second book of the Triangulum Stain series. Basically, without spoiling too much of either book, the ladies of the Five Hive were a tad too successful in stopping Dildoggeddon, and now the entire universe is dying, robbed of the lust and the passions that drive us as a species. There is a lot going on in this second book, but the breathless sort of reading experience is entirely suited to the story being told. It's a bold, busy, and bewildering, but somehow the convergence of sci-fi schlock, monster erotica, and ribald humor really works. Johnson opens up the world here, taking us outside the confines of the original Andromeda Strain homage, and lets his imagination run wild, this time using the Cthulhu mythos (and celebrity pop culture) as his inspiration. The absurdity of The Battle for Alien Relish simultaneously amuses and arouses, making it not just for mature readers only, but also for intelligent (and open minded) ones.